Need more information about booking Home 9236967 ? Nearly perfect weather year round, plan a trip to southwest New Mexico. Our Pinon log cabin studio vacation cabin rental with free wi-fi adjacent to the Gila National Forest, near Silver City, along our private Bear Creek Canyon riparian area is perfect for your next long weekend or full-on vacation holiday to get away from it all. The Double E Ranch Trail is adjacent to and offers unlimited access to 25 square miles of public lands. Endless hiking or horseback riding opportunities (bring your own horses). Our version of a Western studio-type apartment the Pinon Log Cabin is cozy, private, a short walk to year round Bear Creek and private riparian area. At 430 square feet, this little cabin is big on easy comfort. Perhaps our personal favorite, the full kitchen features custom-designed Italian stone counter tops, a 4-burner stove top, microwave, two apartment-sized refrigerators, coffee maker, toaster, microwave, toaster oven, crock pot/slow cooker, blender, toaster, dishes, flatware, cooking pots, utensils and a dinning bar with stools where you can enjoy breakfast or lunch. The hotel quality queen bed ensures you get the best sleep, all snuggled-up in the luxurious Egyptian cotton linens. When you do finally get up, the radiant, in-floor heating will keep your toes nice and warm on chilly mornings and, if you are here during the warmer months, you can count on the AC to keep you cool! The living area features a comfortable sectional fold-open sofa bed with plenty of throw pillows. There is a chest of drawers and vintage cedar armoire. This cabin also boasts a full bath, with shower and tub, and for the evenings when the star-studded sky isn’t quite enough entertainment, there is also a TV/DVD library. If your idea of relaxation is being exhausted from exploring all nature has to offer, you’ll want to stay at the Piñon Log Cabin. The Piñon Log Cabin really is at the end of the road. From the covered deck, you can enjoy views of pastures filled with grazing horses, spy roadrunners, jackrabbits, hawks, deer wild turkey and javelinas. Take in some of the most stunning sunsets and star-filled night skies you could ever imagine. If you sleep better without the glow of city lights and prefer the night sounds of nature to the hum of humanity, then you are going to love the Piñon Log Cabin. 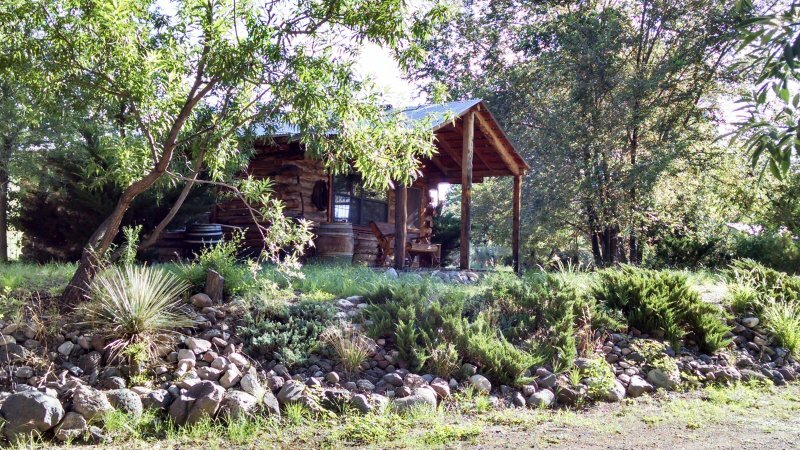 As with the other New Mexico Cabin Rentals, The Piñon Log Cabin provides you the opportunity to experience a taste of life on a southwestern New Mexico ranch, explore a diverse ecological region, and encounter the recent and ancient past up close. Enjoy the easy pace of a day on an historic ranch as you explore the compound and acquaint yourself with the horses. Look for any one of the hundreds of breeds of birds who call the Gila High Desert home as you hike the Double E Ranch Trail, Turtle Rock or explore the boxes and canyons of the Double E Ranch. Travel the path of the Mimbres Indians who lived along Bear Creek and the Gila River 1100 years ago. Uncover their history through pottery pieces, ancient tools, pictographs and remnants of stone dwellings which can still be readily found. Introduce yourself to the more recent legendary characters who roamed the hills, mountains and towns in this area, including Billy the Kid, Geronimo, and Ben Lily. Fill your days and evenings with whatever pleases you because out here, that’s just about the only person you’ll have to answer to. Pet owners agree in advance to keep their pets on leash while on the ranch, bring their own pet beds or crates, compensate New Mexico Cabin Rentals for any damage done by pets. No smoking inside cabins. Respect the privacy of other guests. Contact us with any problems or concerns, immediately.